Do you know how to select the right copywriter for your projects? One of the best pieces of advice I can give any entrepreneur, business owner and marketing professional (remember, if you’re in business you’re a marketer) is to invest in your copy wisely. This means making sure you’re crafting effective messages that move your prospects to take action and support your overall marketing strategies. Often, this means outsourcing your copywriting to a pro. So, once you’ve carefully reviewed your current marketing, advertising and promotional materials and created your content strategy plan, it’s time to make an important business decision. Will you outsource to a professional copywriter or write your copy yourself? While it’s been said that copy is one of the most expensive items to outsource, I have to challenge that a bit. I believe it can hurt your business and cost even more if you don’t have the right person writing your copy. 1) Do your due diligence. This means checking out at least three candidates and selecting the best writer for your job. 2) Get really clear on the process. Copywriters have processes, turn-around time, policies and specific ways they work. Make sure the copywriter of your choice has a work style that gels with you and the way you want things to work in your business. 3) Talk shop. Be sure to review websites, check out testimonials and, if possible, speak with clients who have worked with the copywriters you are considering. Do they offer marketing content strategies, too? This is important when selecting a web design firm, too. Here’s another article with tips about what your customers expect and why finding the right copywriter matters. Remember: All your advertising, marketing and promotional efforts are INVESTMENTS not expenses. If you choose to write your own copy it’s wise to, at the very least invest in topnotch copywriting training or, as I like to say, do what you do best and outsource the rest. Return on investment should drive all of your decisions, so make those decisions wisely and remember, your copywriter should save you time, bring real value to the table in form of creative ideas and experience and make the process as painless as possible for you. When you’re ready to select the right copywriter for your projects, check out the options in the Write On Creative copywriting solutions section of the website. You’ll find packages to meet you where you are when you have copy that needs help (a Manyon Marketing Web Makeover is a great choice), you need copy (we offer various packages for your website content and strategy) or when you want to do it yourself and need programs that guide you through the copywriting process. You can also join the Write On Creative Community and grab your FREE Copywriting Action Plan to help you write better copy. This entry was posted in Copywriting	on Monday	February 11, 2017 at 3:00 pm. You can follow any responses to this entry through the RSS2.0 feed. You can also leave a response. I love that you say it’s an investment not an expense. Good points, Lisa! That really is a HUGE mindset shift that helps entrepreneurs be more successful. Often the thought that something is an expense can paralyze forward movement. 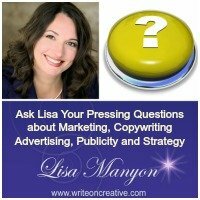 Great reminder Lisa of the most important things to consider when hiring a copywriter – I agree with you that as entrepreneurs we should do what you do best and outsource the rest! Sometimes it’s easier said than done but outsourcing so we can focus on our magic will certainly help us be more successful. Great advice to be taken in by so many. How do you explain to people who are surrounded by the vanity items as being the important items to spend money on? From the look, the photo, the graphics, and then they just scrimp on what really matters, the copy. What do you say? Ah Lisa – I say the same thing … Investing in your website, like your copy, is an INVESTMENT not an expense. Too often people look at the cost of hiring a professional to design and build their website or write their copy as a necessary evil – when in fact it is just the opposite! Investing in quality copywriting and design can huge a tremendous effect on the success of your launch, your sales, your conversion rate, and your business overall. You are speaking my language and that’s exactly why you are one of only a select few trusted design partners I refer my clients to. Thanks for doing such great work.